José Alberto Pujols Alcántara (born January 16, 1980), better known as Albert Pujols (Spanish pronunciation: [ˈalβert puˈxols]), is a Dominican American professional baseball first baseman for the Los Angeles Angels of Anaheim of Major League Baseball (MLB). He previously played for the St. Louis Cardinals, where he received three National League (NL) MVP awards (2005, 2008, 2009) and was a nine-time MLB All-Star (2001, 2003, 2004, 2005, 2006, 2007, 2008, 2009, 2010). He was also an All-Star with the Angels in 2015. Pujols was born in the Dominican Republic and moved to the United States in 1996. After one season of college baseball, he was selected by the Cardinals in the 13th round of the 1999 MLB draft. As a rookie for the Cardinals in 2001, he was unanimously voted the NL Rookie of the Year. Pujols played for the Cardinals for 11 seasons, contributing to two World Series championships in 2006 and 2011. After the 2011 season, Pujols became a free agent and later signed a 10-year contract with the Angels. 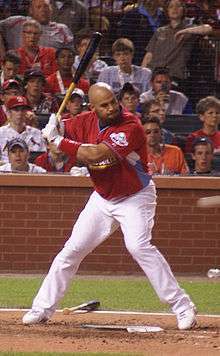 Pujols is a highly regarded hitter who has shown a "combination of contact hitting ability, patience, and raw power". He is a six-time Silver Slugger who has twice led the NL in home runs, and he has also led the NL once each in batting average, doubles and RBI. He is significantly above-average in career regular season batting average (.312), walk rate (12.1 percent), and Isolated Power (.217). Pujols is considered a strong future candidate for the Hall of Fame. Born on January 16, 1980, Pujols was raised in Santo Domingo, Dominican Republic, mostly by his grandmother America Pujols and 10 of his uncles and aunts. He was an only child. His father, Bienvenido Pujols, was a softball pitcher, but he was also an alcoholic. Albert often had to take his father home when his father got drunk following the games. Growing up, Pujols practiced baseball using limes for balls and a milk carton for a glove. Pujols, his father, and his grandmother immigrated in 1996 to New York City, where Albert witnessed a shooting at a grocery store. Partly because of the shooting, they moved to Independence, Missouri, two months later to join some relatives. Few teams were interested in Pujols because of uncertainty about his age, which position he would play, and his build. Tampa Bay Rays scout Fernando Arango recommended that his team sign Pujols, and quit his job when Tampa Bay failed to do so. Pujols was not drafted until the 13th round of the 1999 Major League Baseball (MLB) Draft, when the St. Louis Cardinals selected him with the 402nd overall pick. Pujols initially turned down a $10,000 bonus and spent the summer playing for the Hays Larks of the Jayhawk Collegiate League (a summer league in the National Baseball Congress); his total of 48 runs batted in (RBIs) with the team was tied for ninth with Tyler Wasserman in Larks' history. When the Cardinals increased their bonus offer to $60,000, he signed. 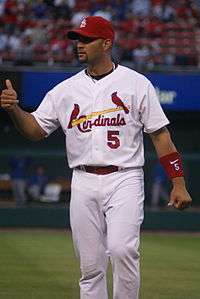 Pujols began his minor league career in 2000 playing third base with the Peoria Chiefs of the single-A Midwest League. He batted .324 with 128 hits, 32 doubles, six triples, 17 home runs, and 84 RBIs in 109 games. He finished second in the league in batting (behind Ryan Gripp), tied for ninth in doubles (with Andrew Beattie and Justin Leone), tied for fourth in triples (with six other players), tied for sixth in home runs (with Shawn McCorkle and Lance Burkhart), and sixth in RBIs. He was voted the league's Most Valuable Player and named to the All-Star team. Pujols also played 21 games with the Potomac Cannons in the high-A Carolina League that year, batting .284 with 23 hits, eight doubles, one triple, two home runs, and 10 RBIs. He finished the season with the Memphis Redbirds in the AAA Pacific Coast League (PCL), and after appearing in three regular season games with them, he batted .367 in the playoffs and was named the postseason Most Valuable Player (MVP) as the Redbirds won their first PCL title. On Opening Day against the Colorado Rockies on April 2, he recorded his first career hit, a single against pitcher Mike Hampton in an 8–0 loss. Four days later, he had three hits and three RBI – including his first home run – against the Arizona Diamondbacks' Armando Reynoso in a 12–9 win. Through 2015, he was one of three players to hit 20 or more home runs in their rookie year before July, along with Wally Berger (1930) and Joc Pederson. At midseason, Pujols became the first Cardinals' rookie since Luis Arroyo in 1955 to make the All-Star Game. He finished the season batting .329 (sixth in the league) with 194 hits (fifth in the league), 47 doubles (fifth in the league), 37 home runs, and 112 runs. His 37 home runs led the Cardinals, topping Jim Edmonds's 30 and McGwire's 29. He was named the National League (NL) Silver Slugger Award winner for the third base position, and he finished fourth in NL Most Valuable Player (MVP) voting, behind Barry Bonds, Sammy Sosa, and Luis Gonzalez. He was unanimously named the NL Rookie of the Year after setting an NL rookie record with 130 RBIs (fifth in the league) and becoming the fourth MLB rookie to hit .300 with 30 home runs, 100 runs, and 100 RBIs. The Cardinals finished the 2001 season with a 93–61 record and advanced to the playoffs as a wild card team. The team won the NL wild card round and advanced to the NL Division Series (NLDS). In Game 2 on October 10, Pujols hit a game-winning two-run home run against Diamondbacks pitcher Randy Johnson in a 4–1 victory. The Cardinals, however, were eliminated in five games, and Pujols had just two hits in 18 at-bats. After playing several positions in 2001, Pujols spent most of 2002 in left field. He began the season batting cleanup but was moved in May to the third spot in the lineup, where he remained for the rest of his Cardinals career. Pujols hit his 30th home run and 100th RBI of the season in a 5–4 loss to the Cincinnati Reds in August, making him the sixth Cardinal to have back-to-back 30-home-run seasons and the second Cardinal (the other was Ray Jablonski) to start his career with back-to-back 100-RBI seasons. The following month, Pujols hit a game-winning two-run single against Pete Munro in a 9–3 victory over the Houston Astros that gave the Cardinals the NL Central title. Pujols finished the year batting .314 (seventh in the NL) with 185 hits (tied for fourth in the NL), 40 doubles (eighth in the NL), 34 home runs (10th in the NL), 118 runs scored (second in the NL to Sosa's 122), and 127 RBIs (second in the NL). He became the first player in major league history to hit over .300 with at least 30 home runs, 100 runs scored, and 100 RBIs in his first two seasons. Pujols finished second in MVP voting to Bonds, becoming the first Cardinal since Stan Musial to finish in the top four in MVP voting for consecutive seasons. At the end of the 2002 season, Chris Haft of MLB.com called him "an outstanding hitter." Pujols's contributions helped the Cardinals finish third in home runs and second in batting average and RBI; the Cardinals' pitching staff also finished fourth in ERA. The Cardinals again reached the playoffs, and Pujols had three hits and three RBI in a three-game sweep of the Diamondbacks in the 2002 NLDS. The team advanced to the 2002 NL Championship Series (NLCS), but lost in five games to the San Francisco Giants. Pujols had five hits, one home run, and two RBI in the series. Five Cardinals were named to the All-Star Game in 2003 while Pujols led the NL in votes. It was the first of eight straight seasons that Pujols would reach the All-Star Game. From July 12 to August 16, Pujols had a 30-game hitting streak, tied for the second-longest in Cardinals' history with Musial and behind only Rogers Hornsby's 33-game streak. On July 20, Pujols hit his 100th career home run, a game-winner in a 10–7 victory over the Dodgers. He became the fourth major leaguer to hit his 100th home run in his third season, along with Ralph Kiner, Eddie Mathews, and Joe DiMaggio. Pujols hit his 114th home run on September 20 in a game against the Astros, which tied him with Kiner for most home runs by a player in his first three seasons. In 157 games, Pujols hit 43 home runs (fourth in the league, behind Jim Thome, Richie Sexson, and Bonds) and had 124 RBI (tied with Sexson for fourth and behind Preston Wilson, Gary Sheffield, and Thome). He became the youngest player since Tommy Davis in 1962 to win the NL batting title after batting .359, and he led the league in runs (137), hits (212), and doubles (51). Pujols joined Rogers Hornsby as the only players in Cardinals' history to record more than 40 homers and 200 hits in the same season. Though his stellar play had Cardinals' fans chanting "M-V-P!" during home games as early as June, Pujols again finished second to Bonds in MVP voting. He won his second Silver Slugger Award and first Sporting News Player of the Year Award. Pujols' contributions helped the Cardinals rank second in batting average and third in home runs in the NL; however, the pitching staff posted a 4.60 ERA, which was below the league average, and the Cardinals missed the playoffs. Pujols's highlights later in the season included a July game in which he hit five RBIs and three home runs and another in which he broke up a no-hitter by Giants pitcher Dustin Hermanson. During a September game against the Rockies, he earned his 500th RBI, joining DiMaggio and Ted Williams as the only players to have 500 RBIs in their first four seasons. He said he was confident there was going to be "a lot more". 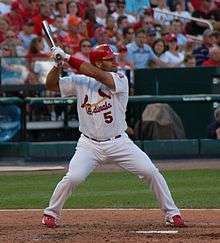 Although Pujols was diagnosed with plantar fasciitis during the second half of the season, he finished the season with a .331 average (fifth in the league), 196 hits (fifth), 51 doubles (second to Lyle Overbay's 53), 46 home runs (tied with Adam Dunn for second behind Adrián Beltré's 48) and 123 RBIs (third, behind Vinny Castilla's 131 and Scott Rolen's 124) in 154 games. He also led the league in runs scored, with 133. He finished third in MVP voting (behind Bonds and Beltré), joining Musial as the only Cardinals to finish in the top five in voting for at least four years in a row. He won the Silver Slugger Award at first base, the third position he won the award at. Pujols, along with teammates Edmonds and Rolen, earned the nickname "MV3" for their phenomenal seasons; Pujols led the three in home runs and batting average. The Cardinals won the NL Central, aided by the MV3 and pitcher Chris Carpenter, who won 15 games and had a 3.46 ERA his first season with the team. In Game 4 of the NLDS against the Dodgers, Pujols hit a three-run home run against Wilson Álvarez and had four RBIs as the Cardinals won 6–2 and took the series three games to one. In Game 6 of the NLCS, Pujols had three hits, scored three runs (including the winning run), and hit a two-run home run off Munro in a 12-inning, 6–4 victory. The Cardinals won the series in seven games, advancing to the World Series for the first time since 1987. Pujols was named the NLCS MVP after batting .500 with four home runs and nine RBIs. He was one of three Cardinals to bat over .250 in the series against the Boston Red Sox (after batting .333) as the Cardinals were swept by Boston in four games. By 2005, many baseball fans thought that Pujols was the best Cardinal since Musial. Pujols picked up his 100th RBI of the season on August 31, joining Williams, DiMaggio, and Al Simmons as the only players with 100 RBI in their first five seasons. Pujols hit his 200th career home run in a game against the Reds on September 30, making him the third-youngest major league player to reach that milestone (behind Mel Ott and Eddie Mathews) and the second-fastest to reach it (behind Kiner). In 161 games, Pujols batted .330 (second to Derrek Lee's .335 average) with 195 hits (fourth behind Lee, Miguel Cabrera, and Jimmy Rollins), 38 doubles, 41 home runs (third, behind Andruw Jones's 51 and Lee's 46), 117 RBIs (tied with Burrell for second behind Jones's 128), and 129 runs scored (first in the league). For the first time in his career, he won the NL MVP award as Bonds was limited to 14 games due to an injury. Pujols returned to the playoffs as the Cardinals won the NL Central for the second year in a row. He had five hits in nine at-bats with four runs scored and two RBI in the NLDS as the Cardinals swept the Padres. In Game 5 of the NLCS against the Astros, with the Cardinals trailing by two runs and only one out from elimination in the ninth inning, Pujols hit a game-winning three-run home run against Brad Lidge that landed on the train tracks in the back of Minute Maid Park. The Cardinals won 5–4. MLB.com writer Matthew Leach later called it "one of the most famous playoff home runs in recent years." Nevertheless, the Cardinals were eliminated in Game 6 by the Astros. Pujols batted .304 with two home runs and six RBIs in the series. Over two games in April 2006, Pujols hit home runs in four consecutive plate appearances, making him the 20th player to accomplish the feat. Pujols maintained after the game that he was more concerned with winning than the numbers: "I don't look at numbers", he said. "I don't know. I didn't know anything about [the record] until you guys brought it up. Because that's not me. I don't get locked in on numbers. I don't get locked in on anything like that. I get locked in on seeing the ball and helping my team out to win and hopefully doing some damage out there." Pujols finished the season with a .331 average (third to Freddy Sanchez' .344 and Cabrera's .339), 177 hits, 33 doubles, 49 home runs (second to Ryan Howard's 58), 137 RBI (second to Howard, 149), and 119 runs scored (tied with Matt Holliday, Hanley Ramírez, and Alfonso Soriano for fifth). Of his 49 home runs, 20 accounted for a game-winning RBI, breaking Willie Mays' single-season record set in 1962. He finished second to Howard in MVP voting and won the NL Gold Glove Award for first base. He won his first of four consecutive Fielding Bible Awards for the first base position. Near the beginning of the 2007 season in an April 22 game against the Cubs, Pujols hit a game-winning three-run home run against Ryan Dempster in the 10th inning of a 12–9 victory, tying Ken Boyer for second all-time on the Cardinals' home run list with his 255th. Pujols finished the season with 185 hits, 38 doubles and 103 RBIs (a career-low). He was among the league leaders in batting average (.327, sixth) and home runs (32, tied with Carlos Lee and Chris Young) for tenth. He scored 99 runs, ending his streak of seasons with at least 30 home runs, a .300 average, 100 runs scored, and 100 RBIs at six. He finished ninth in MVP voting, the first year he had finished outside the top five in his career. On September 11, in a 3–2 loss to the Cubs, Pujols hit his 100th RBI of the season against Rich Harden, making him the third player in major league history to start his career with eight seasons of at least 100 RBIs (along with Simmons and Williams). He regretted that the milestone came in a loss, saying, "I wish it would have come with a great win. It would have been more special." In 148 games in 2008, Pujols batted .357 (second to Chipper Jones's .364 average) with 187 hits (third, behind Reyes's 204 and David Wright's 189), 44 doubles (tied with Stephen Drew and Aramis Ramírez for fourth in the league behind Berkman and Nate McLouth's 46 and Corey Hart's 45), 37 home runs (tied with Ryan Braun and Ryan Ludwick for fourth in the league behind Howard's 48, Dunn's 40, and Delgado's 38), 116 RBIs (fourth, behind Howard's 146, Wrights 124, and Adrian Gonzalez's 119), and 100 runs scored. Pujols won his second NL MVP Award, and he won the Silver Slugger Award for the fourth time in his career. He was named The Sporting News Player of the Year for the second time in his career. For his work off the field, he was named the 2008 winner of the Roberto Clemente Award. He considered having Tommy John surgery after the season but underwent nerve transposition surgery on his right elbow instead to ease discomfort. On April 25, 2009, Pujols picked up his 1,000th career RBI with a 441-foot grand slam against David Patton in an 8–2 victory over the Cubs. "I hit that ball as good as I can hit a ball", he said after the game. On July 3, he hit his 10th career grand slam against Weathers in a 7–4 victory over the Reds, breaking Musial's record for most grand slams by a Cardinal. The grand slam was also his 350th career home run, making him the third-fastest player to reach the milestone, behind Alex Rodriguez and Ken Griffey, Jr.. He received the highest number of votes in NL history for the All-Star Game that year. Pujols had four hits, three runs scored, and five RBIs on August 4, including a grand slam against Sean Green which tied the NL record for most grand slams in a season (five), in a 10-inning, 12–7 victory over the Mets. In 160 games, Pujols batted .327 (third, behind Ramírez's .342 and Pablo Sandoval's .330) with 186 hits (sixth), 45 doubles (second to Miguel Tejada's 46), 47 home runs (first), 135 RBIs (third behind Fielder and Howard's 141), and 124 runs scored (first). He was unanimously named the NL MVP for the third time, tying Musial as the Cardinals' leader in that category. For the fifth time in his career, he won the Silver Slugger Award. He won the Sporting News MLB Player of the Year award for the second consecutive year, joining Williams and Joe Morgan as the only players to win it in back-to-back years. For the fourth year in a row, he won the Fielding Bible Award for first base. Aided by the midseason acquisition of Matt Holliday (who replaced Ryan Ludwick as the cleanup hitter) and the emergence of Adam Wainwright (who led the NL in wins), the Cardinals returned to the playoffs after a two-year hiatus. In the NLDS against the Dodgers, Pujols batted .300 with one RBI as the Cardinals were swept in three games. Following the postseason, Pujols had surgery to remove five bone spurs from his right elbow. The Cardinals called the surgery a "success", and Dr. James Andrews decided that Pujols did not need Tommy John surgery at that time. On June 29, 2010, in an 8–0 victory over the Diamondbacks, Pujols hit five RBI and hit two home runs against Dontrelle Willis for his 37th career multihomer game, which tied Musial's franchise record for multihomer games. "It's pretty special", he said of tying Musial. "I'm blessed to have the opportunity to be compared sometimes with him." On August 26, he hit his 400th career home run against Jordan Zimmermann in a 13-inning, 11–10 loss to the Nationals. He became the third-youngest player to reach the milestone—behind Griffey, Jr. and Rodriguez—and he became the fourth-quickest player by at bats to reach the milestone (behind McGwire, Babe Ruth, Harmon Killebrew, and Thome). On September 11, in a 12-inning 6–3 loss to Atlanta, Pujols had three RBI and reached 100 RBI for the 10th consecutive year with a two-run double against Tommy Hanson. Only Simmons has a longer streak of 100 RBI seasons at the beginning of a career, with 11. Pujols joined Jimmie Foxx, Lou Gehrig, and Rodriguez in having 10 consecutive seasons of 100 or more RBI at any time in their career. Foxx and Rodriguez are the only two players besides Pujols to have 10 consecutive years of 30 home runs and 100 RBIs. The next day, in a 7–3 victory over the Braves, he passed Musial to be the all-time Cardinals' leader in multi-home run games when he hit two home runs against Tim Hudson for the 38th time in a game. In 159 games, Pujols batted .312 (sixth) with 183 hits (fifth) and 39 doubles (tied for eighth with Marlon Byrd); he led the league in runs scored (115), home runs (42), and RBIs (118). He won his second Gold Glove Award for first base, and he won the NL First Base Silver Slugger Award for the sixth time. He finished second in the NL MVP voting to Joey Votto, who said he was "shocked" that Pujols only got one first-place vote. Pujols and the Cardinals set a deadline for the start of 2011 spring training for contract extension negotiations but failed to reach an agreement. After Pujols struggled in his first 30 games of the season in batting .231, he batted .316 with 30 home runs in his final 117 games. Against the Cubs, he hit consecutive extra-inning walk-off home runs on June 4 and 5 for the first time since Albert Belle in 1995. Carpenter noted after the game that Pujols' slump earlier in the year was over: "He continues to do great things, there's no doubt about it", he said. "The things that he's done the last few days have been just like the old Albert." On June 19 against the Royals, Wilson Betemit collided with Pujols, inducing a small fracture his left wrist and keeping him inactive until July 5. On July 30, in a 9–2 victory over the Cubs, he got his 2,000th career hit against Carlos Mármol, becaming the fifth Cardinal to reach 2,000 hits and 12th fastest major leaguer by games to reach the milestone. In the Cardinals' final game of the season, against the Astros on September 28, he had the game-winning RBI against Brett Myers in the 8–0 victory, helping the Cardinals overcome a 10.5 game deficit to Atlanta to win the Wild Card. Pujols finished the season with 173 hits (tied for ninth with Aramis Ramírez), 29 doubles (a career-low), and 105 runs scored (tied for third with Justin Upton behind Ryan Braun's 109 and Matt Kemp's 115). He saw his streak of seasons batting at least .300 with 30 home runs and 100 RBIs snapped when he hit 37 home runs (third, behind Fielder's 38 and Kemp's 39) but batted .299 with 99 RBIs (seventh); however, only three other players in the major leagues matched him in those categories (José Bautista, Fielder, and Kemp), causing Tyler Kepner of The New York Times to write, "Even when Pujols struggles, he excels." He was fifth in MVP voting. In Game 2 of the NLDS against the Phillies on October 2, Pujols had a game-winning RBI single against Cliff Lee in the 5–4 victory. He batted .350 with one RBI in the series as the Cardinals defeated the Phillies in 5 games. In Game 2 of the NLCS against the Brewers, he had four hits, three runs scored, one home run, and five RBIs in a 12–3 victory. He batted .478 with two home runs and nine RBIs in the series as the Cardinals defeated the Brewers in six games. On October 22, in Game 3 of the World Series, Pujols became the first player to get at least four hits, two home runs, and five RBIs in a World Series game in a 16–7 victory over the Rangers. Pujols had five hits, three home runs, four runs scored, and six RBIs in the game. He joined Babe Ruth and Reggie Jackson as the only players in baseball history to hit three home runs in a World Series game (Pablo Sandoval would also accomplish the feat the following year), became the first player in series history to have hits in four consecutive innings, and tied records for most hits and most RBIs in a World Series game. He had one hit and no RBIs the other six games of the series but became a World Series champion for the second time as the Cardinals defeated the Rangers in seven games. After the season, he became a free agent for the first time in his career. Three teams were reported to be interested in Pujols during the offseason: the Cardinals, the Miami Marlins, and the Los Angeles Angels of Anaheim. The Cardinals offered Pujols a 10-year, $210 million deal (with $30 million deferred), but Pujols rejected it. His wife explained on a radio talk show that they were "insulted" and "confused" that the Cardinals had initially offered Pujols a five-year deal. The Marlins reportedly offered Pujols a 10-year contract too, but on December 8 he signed a 10-year deal with the Angels worth around $254 million. The contract offered by the Marlins was reportedly around the value as that offered by the Angels. However, the Marlins (who have a history of fire sales) refused to include a no trade clause in the contract. Pujols did not perform very well to begin the 2012 season, batting .217 with no home runs and four RBIs in the month of April. Soon after the Angels called up top prospect Mike Trout and fired hitting coach Mickey Hatcher, Pujols's numbers began to rise, as he batted .323 with 13 home runs from May 15 through the All-Star Break. On July 31, he hit two home runs against Derek Holland in a 6–2 victory over the Rangers. After the game, Holland observed that Pujols had ended his early-season struggles: "He's definitely turned it around, no doubt about it", he said. "He is what he is. He had a slow start, but he's picked it up. He's a great hitter. He and Trout are doing a great job picking [the Angels] up." On August 14, Pujols had four RBI, including a game-winning three-run home run against Ubaldo Jiménez in a 9–6 victory over the Cleveland Indians. In 153 games, Pujols batted .285 with 173 hits, 50 doubles (second to Alex Gordon's 51), 30 home runs, 105 RBI (7th in AL), and 85 runs scored. On August 18, 2013, Pujols was ruled out for the remainder of the 2013 season after suffering a knee injury. Pujols had by far the worst season of his career in 2013, failing to play at least 100 games for the first time in his career. Pujols also posted career worsts in hits, runs scored, doubles, home runs, RBI, walks, batting average, on base percentage, slugging percentage, and OPS. Overall in 99 games, Pujols batted .258 with 101 hits, 19 doubles, 17 home runs, 64 RBI, and 49 runs scored. In August 2013, former Cardinals player Jack Clark accused Pujols of using performance-enhancing drugs on his radio show on WGNU in St. Louis. Clark served as the Cardinals' hitting coach during the early part of Pujols' tenure in St. Louis. On the morning of August 9, Pujols issued a statement adamantly denying that he had ever taken PEDs. He denounced Clark's allegations as "irresponsible and reckless" and threatened to sue Clark and WGNU over the allegations. Partly due to legal threats from Pujols, InsideSTL Enterprises, which owns WGNU's weekday airtime under a time brokerage agreement, cut ties with Clark. On October 4, 2013, Pujols filed a defamation lawsuit against Clark. In response on October 14, Clark challenged Pujols to both take polygraph tests to resolve who is telling the truth. However, on February 10, 2014, Clark apologized and retracted his accusations against Pujols, saying he had "no knowledge whatsoever" that Pujols ever used PEDs. "During a heated discussion on air, I misspoke", Clark said. In return, Pujols dropped the suit. On April 22, 2014, Pujols hit his 499th and 500th home run of his career off of Taylor Jordan in a game versus the Washington Nationals at Nationals Park. Pujols became the 26th player ever to reach the 500 home run mark, as well as the third youngest to reach it. He also became the first player to hit career home runs 499 and 500 in the same game. Nationals Park is the same ballpark where he hit his 400th career home run in the 2010 season. Participating in the longest game of the year in MLB, and the longest in the history of Angel Stadium, Pujols ended a 19-inning, 6:31 contest against the Red Sox with a solo home run for a 5–4 final score. It was also his first walk-off home run as an Angel and first since June 2011. On September 6, 2014 against the Minnesota Twins, Pujols collected his 2,500th career hit, a two-run go-ahead double off of Jared Burton in the 9th inning. He also passed the 1,500 run mark in the same game. In the process, he became the fifth player in major league history with 2,500 hits and 500 home runs while maintaining a .310 lifetime batting average (the others are Babe Ruth, Jimmie Foxx, Ted Williams and Manny Ramirez). Pujols leads all active players in doubles, with 561. Before the 2015 season, Pujols enjoyed his first offseason in his time with the Angels in which he was either free of injury or recuperation from injury. However, his offensive production lagged behind his career levels the first month of the season. By the end of April, Pujols was batting .208 with three home runs and nine RBI in 86 plate appearances. While it was suggested that this was because of older age, or his recent poor health while with the Angels, it seemed to be simply due to bad luck. The next month, Pujols' offensive production had started to come around. Between May 28, 2015 and June 22, 2015, he batted .356 with 15 homers, 30 RBI and 1.326 OPS. At this time, he was led the American League in home runs with 23, and was on pace to hit more than 50. On September 22, 2015, Pujols hit his 556th career home run to pass Ramírez for sole possession of 14th place on the all-time career home run leaderboard. In the last game of the season, on October 4, Pujols hit his 40th home run, the seventh time he had done so. Among active MLB players, it trailed only Alex Rodriguez, with eight. With Trout also hitting 40 home runs, the 2015 Angels became just the 31st team in MLB history with multiple players to hit 40+ home runs in a season. On April 25, 2016, Pujols hit his 564th career home run, passing Reggie Jackson for 13th on the all-time list. On April 30, Pujols became the 85th player to make 10,000 career plate appearances. On May 2, Pujols became the 20th player all time to amass 5,000 career total bases. In a contest against the Astros on May 27, Pujols hit his 570th career home run, passing Rafael Palmeiro for 12th on the all-time list. On June 25, Pujols hit his 574th career home run, passing Harmon Killebrew for 11th all time. On August 17, Pujols joined Barry Bonds as the only other player to be intentionally walked over 300 times. While playing the Toronto Blue Jays on August 24, Pujols hit his 584th career home run passing Mark McGwire for 10th on the all-time home run list. The next day, also against Toronto, he reached 100 RBI for the 13th time in his career, the fifth player to do so. Pujols married his wife, Deidre, on January 1, 2000. They have five children: Isabella (Deidre's daughter from a previous relationship), Albert, Jr., Sophia, Ezra, and Esther Grace. During the offseason, they live in St. Louis. Albert and his wife are supporters of people with Down syndrome, a condition Isabella was born with. In 2007, Pujols became a U.S. citizen, scoring a perfect 100 on his citizenship test. Pujols is close friends with third baseman Plácido Polanco, a former teammate with the Cardinals. Polanco has called Pujols his "closest friend in baseball", and Pujols is the godfather to Polanco's son, Ishmael. Pujols is also friends with Robinson Canó, who selected Mark Trumbo for the 2012 Home Run Derby after Pujols asked him to. In 2008, Pujols teamed up with St. Louis Soccer United, a group looking to bring a Major League Soccer (MLS) franchise to the St. Louis area. However, the group's bid for a franchise was unsuccessful, and a minor league soccer team was created instead. "My life's goal is to bring glory to Jesus. My life is not mostly dedicated to the Lord, it is 100% committed to Jesus Christ and His will. God has given me the ability to succeed in the game of baseball. But baseball is not the end; baseball is the means by which my wife, Dee Dee, and I glorify God. Baseball is simply my platform to elevate Jesus Christ, my Lord and Savior." Through 2012, Pujols ranked in the top 10 players in major league history in three statistical categories: slugging percentage (fifth), on-base plus slugging (OPS; sixth), and OPS+ (tied for ninth with Ty Cobb). At the end of the 2012 season, he led all active players in batting average (.325), slugging percentage (.608), and OPS (1.022). Through 2012, he ranked among the top 10 active players in doubles (ninth), home runs (fourth, behind Rodriguez, Thome, and Manny Ramirez), RBIs (sixth), and runs scored (ninth). Pujols has a .994 fielding percentage at first base (through 2012), and he set the major league single-season record for assists with 185 in 2009. Pujols is in the top 10 in several Cardinals' statistics. He is second to Musial in doubles (455), home runs (445), and RBIs (1,329). He is seventh in games (1,705), seventh in batting average (.328), third in runs scored (1,291, behind Musial and Lou Brock), and fourth in hits (2,073, behind Musial, Brock and Hornsby). He also is in the top 10 in several single-season Cardinals' records. His 137 runs scored in 2003 are tied for seventh with Tommy McCarthy, his 51 doubles in 2003 and 2004 are tied with Musial for sixth, he holds five of the top 10 Cardinals' home run totals, and his 137 RBIs in 2006 are tied for seventh with Jim Bottomley, Johnny Mize, and Joe Torre. ↑ "Albert Pujols". Retrieved November 22, 2014. ↑ "K% and BB%". Fangraphs.com. Retrieved November 22, 2014. ↑ "ISO". Fangraphs.com. Retrieved November 22, 2014. 1 2 3 4 5 6 Posnanski, Joe (March 16, 2009). "The Power To Believe". si.com. Retrieved June 28, 2015. ↑ "Larks Batting Records". Hays Larks. Retrieved May 1, 2012. ↑ "Past Champions". milb.com. Retrieved May 2, 2012. ↑ "Season by Season Results for the St. Louis Cardinals". Mr. Everett. Retrieved December 11, 2012. ↑ Leach, Matthew (August 27, 2002). "Cards suffer loss to Reds". Cardinals.MLB.com. Retrieved May 21, 2012. ↑ Leach, Matthew (September 20, 2002). "That's an NL Central winner!". Cardinals.MLB.com. Retrieved May 23, 2012. ↑ Haft, Chris (October 6, 2002). "Pujols delivers with bat, arm". Cardinals.MLB.com. Retrieved December 12, 2012. 1 2 Leach, Matthew (July 6, 2003). "All-Star Game draws five Cards". Cardinals.MLB.com. Retrieved May 26, 2012. ↑ Leach, Matthew (August 22, 2003). "Cards stumble late against Phils". Cardinals.MLB.com. Retrieved May 29, 2012. 1 2 3 Leach, Matthew (October 20, 2003). "Pujols earns Sporting News award". Cardinals.MLB.com. Retrieved June 1, 2012. ↑ Leach, Matthew (July 20, 2003). "Cards win slugfest in Los Angeles". Cardinals.MLB.com. Retrieved May 25, 2012. ↑ Leach, Matthew (September 20, 2003). "Pujols lifts Cards, special fan". Cardinals.MLB.com. Retrieved May 29, 2012. 1 2 Leach, Matthew (September 28, 2003). "Pujols takes home NL batting title". Cardinals.MLB.com. Retrieved May 31, 2012. 1 2 Leach, Matthew (October 29, 2003). "Pujols, Rentería win Silver Sluggers". Cardinals.MLB.com. Retrieved June 1, 2012. ↑ "Baseball: Roundup; Pujols Is a Handful: 5 for 5 and 5 R.B.I.". The New York Times. July 21, 2004. Retrieved December 3, 2012. 1 2 Leach, Matthew (October 10, 2004). "Pujols powers Cards into NLCS". Cardinals.MLB.com. Retrieved June 13, 2012. ↑ Leach, Matthew (October 20, 2004). "Edmonds' homer evens up NLCS". Cardinals.MLB.com. Retrieved June 14, 2012. 1 2 Shpigel, Ben (November 16, 2005). "Pujols's Excellence Finally Earns Him an M.V.P.". The New York Times. Retrieved September 1, 2008. 1 2 Leach, Matthew (November 13, 2008). "Pujols, Ludwick honored for offense". Cardinals.MLB.com. Retrieved July 8, 2012. 1 2 Leach, Matthew (July 5, 2009). "Trio of Cards heading to All-Star Game". Cardinals.MLB.com. Retrieved July 6, 2009. 1 2 Leach, Matthew (November 24, 2009). "Third time is charming for MVP Pujols". Cardinals.MLB.com. Retrieved July 17, 2012. 1 2 Leach, Matthew (November 12, 2009). "Pujols rakes in fifth Silver Slugger". Cardinals.MLB.com. Retrieved July 18, 2012. ↑ Walton, Brian (October 20, 2009). "Pujols Elbow Surgery Wednesday". Scout.com. Retrieved July 20, 2012. 1 2 Bollinger, Rhett (May 11, 2010). "Pujols voted Clutch Performer for April". Cardinals.MLB.com. Retrieved July 24, 2012. 1 2 3 Leach, Matthew (November 10, 2010). "Molina, Pujols honored with Gold Glove Awards". Cardinals.MLB.com. Retrieved July 26, 2010. 1 2 Leach, Matthew (November 11, 2010). "Pujols, Holliday rewarded with Silver Sluggers". Cardinals.MLB.com. Retrieved July 26, 2012. ↑ Laymance, Austin (July 30, 2011). "Pujols adds to illustrious career with 2,000th hit". Cardinals.MLB.com. Retrieved August 2, 2012. ↑ Kruth, Cash (December 8, 2011). "Marlins lose out on free agents Pujols, Wilson". Marlins.MLB.com. Retrieved August 6, 2012. ↑ Blum, Ronald (December 8, 2011). "Pujols, Angels agree to $254 million, 10-year deal". Yahoo!. Retrieved December 8, 2011. ↑ Gonzalez, Alden (May 1, 2012). "Pujols shrugs off homerless April". Angels.MLB.com. Retrieved August 6, 2012. ↑ Meisel, Zack (April 27, 2012). "Trout recalled as Angels release veteran Abreu". Angels.MLB.com. Retrieved August 7, 2012. ↑ NAN Sports Editor (May 5, 2016). "The richest Dominican Republic-born players in Major League Baseball today". News America Now. Retrieved September 1, 2016. ↑ "Pujols reaches 100 RBIs for 13th time, Angels beat Jays 6−3". USA Today. Associated Press. August 25, 2016. Retrieved August 28, 2016. ↑ "Deidre Pujols". Pujols Family Foundation. Retrieved August 1, 2012. ↑ "Mission Statement". Pujols Family Foundation. Retrieved August 10, 2006. ↑ "Career Leaders & Records for Slugging %". Baseball-Reference.com. Retrieved August 8, 2012. ↑ "Career Leaders & Records for On-Base Plus Slugging". Baseball-Reference.com. Retrieved August 8, 2012. ↑ "Career Leaders & Records for Adjusted OPS+". Baseball-Reference.com. Retrieved August 7, 2012. ↑ "Active Leaders & Records for Batting Average". Baseball-Reference.com. Retrieved August 9, 2012. ↑ "Active Leaders & Records for Slugging %". Baseball-Reference.com. Retrieved August 9, 2012. ↑ "Active Leaders & Records for On-Base plus Slugging". Baseball-Reference.com. Retrieved August 9, 2012. ↑ "Active Leaders & Records for Doubles". Baseball-Reference.com. Retrieved August 9, 2012. ↑ "Active Leaders & Records for Home Runs". Baseball-Reference.com. Retrieved August 9, 2012. ↑ "Active Leaders & Records for Runs Batted In". Baseball-Reference.com. Retrieved August 9, 2012. ↑ "Active Leaders & Records for Runs Scored". Baseball-Reference.com. Retrieved August 9, 2012. ↑ Leach, Matthew (October 4, 2009). "Pujols sets first baseman assist mark". Cardinals.MLB.com. Retrieved August 9, 2012. ↑ Stark, Jayson (April 24, 2008). "Identifying the most feared hitter in the bigs". ESPN. Retrieved July 23, 2012. ↑ Bollinger, Rhett (July 20, 2009). "Pujols wins ESPY for Best Baseball Player". Cardinals.MLB.com. Retrieved July 20, 2012. ↑ Footer, Alyson (October 22, 2003). "Pujols, A-Rod win Aaron award". Cardinals.MLB.com. Retrieved June 1, 2012. ↑ Leach, Matthew (November 1, 2009). "Aaron Award is latest hardware for Pujols". Cardinals.MLB.com. Retrieved July 19, 2012. ↑ Leach, Matthew (July 4, 2004). "Rentería gives Cards three of a kind". Cardinals.MLB.com. Retrieved June 11, 2012. ↑ Leach, Matthew (June 2, 2003). "Pujols is NL Player of the Month". Cardinals.MLB.com. Retrieved May 28, 2012. ↑ Leach, Matthew (July 2, 2003). "Pujols takes back-to-back months". Cardinals.MLB.com. Retrieved May 28, 2012. ↑ Leach, Matthew (May 5, 2003). "Pujols named week's best". Cardinals.MLB.com. Retrieved May 25, 2012. ↑ Drellich, Evan (June 6, 2011). "Pujols breaks out, wins NL Player of Week". Cardinals.MLB.com. Retrieved August 1, 2012. 1 2 Leach, Matthew (November 5, 2003). "Pujols named the best by his peers". Cardinals.MLB.com. Retrieved June 1, 2012. 1 2 Frisaro, Joe (October 30, 2009). "Pujols given top honor by his peers". Cardinals.MLB.com. Retrieved July 19, 2012. 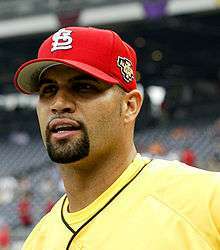 ↑ "Sporting News' MLB Athlete of the Decade: Albert Pujols, 1B, Cardinals". The Sporting News. September 24, 2009. Retrieved July 19, 2012. ↑ González, Alden (September 24, 2009). "Pujols is TSN's Player of the Decade". Cardinals.MLB.com. Retrieved July 19, 2012.